Discover Lehigh Valley, the designated destination marketing organization of Lehigh and Northampton counties, has made family traveling, eating, shopping, and playing on a budget easy with Summer of Savings – a web-based travel promotion that offers huge savings on more than 20 area hotels, attractions, restaurants and shops. Getting in on the hot savings is easy. 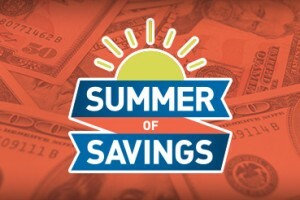 Simply head to DiscoverLehighValley.com and click Summer of Savings in the “Save” dropdown menu. Every participating partner in the online promotion offers coupons that can be downloaded and printed. Visitors just need to present the coupon(s) when making a purchase, placing a reservation or buying tickets to receive the advertised discount. Pocono Whitewater Rafting, Historic Hotel Bethlehem, Galen Glen Winery, The Colony Meadery, and Staybridge Suites Allentown Bethlehem Airport are just a few of the many businesses participating in this online promotion. Summer of Savings discounts are arranged in three categories: Play, Stay, and Eat. The coupons include reduced prices for admissions, buy-one-get-one-free deals, discounts on purchases and more. Savings run through Labor Day weekend.